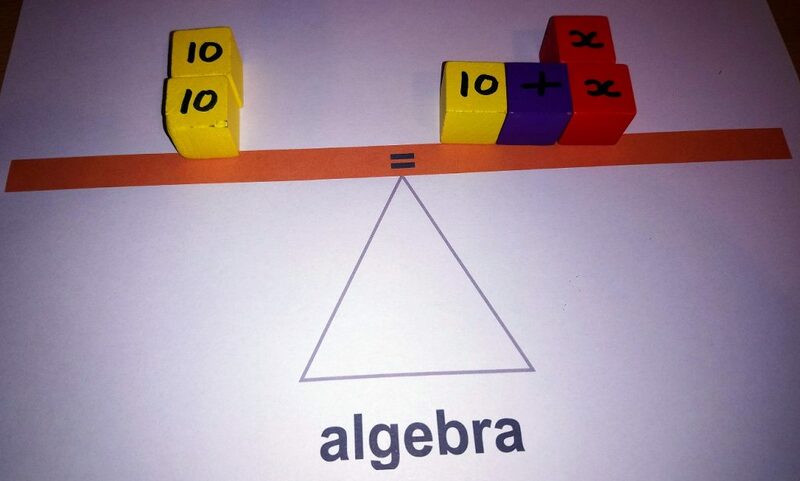 Teaching Algebra – it’s just like fractions! I wrote a while ago about teaching basic algebra to children and taking away their fear. But what do you do when it becomes a little more complicated? and the child was unsure how to start. I reminded her of when we had looked at ordering fractions and asked how she did that. I praised her for remembering so well and then told her this problem was just the same. It looked hard because k, m and n were all different, but maybe she could make them the same. As soon as she started to think of the problem in that way she was able to see that m could be changed into 3n and k could be changed into 2n, so the problem was 2n + 3n + n = 1500 or 6n = 1500. Once she had worked out that this meant that n must be 250 she had no problem at all in converting 2n back to k and 3n back to m, giving the solution k=500, m=750 and n=250. Algebra – it’s not too hard. It’s just like ordering fractions! If you live in north Birmingham and would like to book my services as a private maths tutor, please get in touch. Algebra? It’s Just a Box! Algebra is a scary word. I know because it scared me when I was younger. I hated maths at school. I didn’t understand it, I didn’t want to understand it and I have no idea how I managed to get my maths O’level! It’s only since deciding, later in life, that I wanted to become a teacher that I have relearned maths and, thanks to family and this brilliant book by Derek Haylock, discovered that it doesn’t have to be hard. I can remember sitting in lessons, struggling with numbers and then being horrified when suddenly we had letters thrown in as well. That didn’t make sense – letters belonged in English lessons, not maths. Given all that, I can understand why children panic when it comes to algebra. The best way I have found to reassure them is to tell them it’s just a box. 5 + n = 7 looks impossible to some children, so we take the letter away and replace it with a box. 5 + □ = 7 is the sort of thing they’ve been used to since KS1. 5 x □ = 20 . Simple! For maths or English tuition in the north Birmingham, Sandwell and Walsall area visit www.sjbteaching.com. For links to other interesting education-related articles, please like my facebook page.